The Coast Star Article - Stop The Lot!! Brielle — Plans to construct a parking lot on Green Avenue, here, have been halted without explanation, and while some residents are pleased, others are cautiously wary of what’s to come next. In late August, an addendum for a zoning variance, filed on behalf of 608 Green Avenue, LLC, and Hoffman’s Marina West, LLC, sought to construct 23,237-square-foot parking area on a lot of the same size located at 623 Green Ave. Filed on behalf of Larry Grafas, the application sought approval “for the creation of a parking lot limited to slip holders in Hoffman’s Marina West and Union Landing Marina,” both of which are properties currently owned by Mr. Grafas. The application was filed in response to a denied zoning permit application, dated June 16, that denied the construction of commercial parking facilities in a R-4 Single Family Residential Zone, on the basis that such a project would require a use variance. 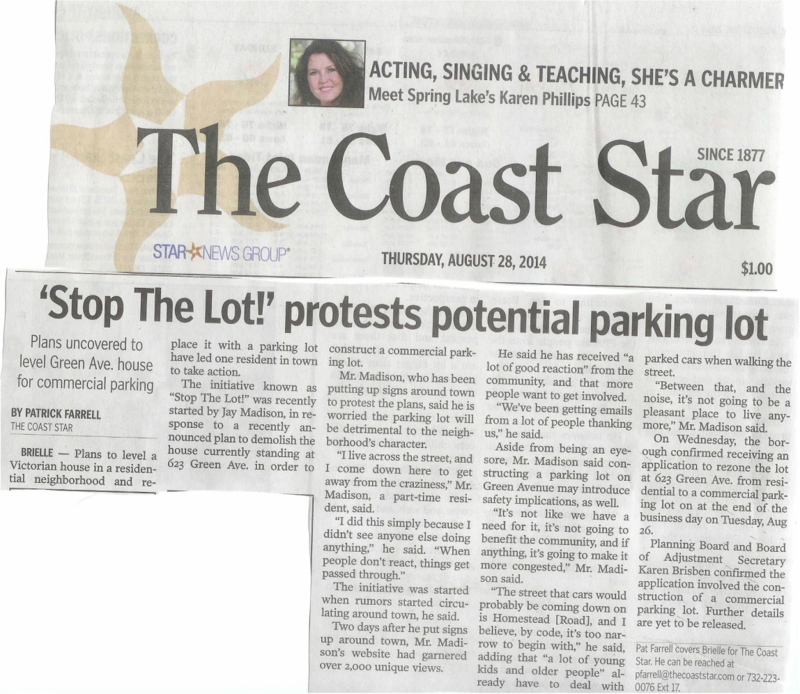 Upon hearing of the plans for the parking lot, resident Jay Madison, of Green Avenue, began an initiative to protest the project, named “Stop the Lot,” which aimed to unite area residents to protest the parking lot. The hearing for the lot was originally scheduled for Oct. 15, but as of last week, attorney C. Keith Henderson, on behalf of Mr. Grafas, requested the hearing be postponed. No further information has been provided by Mr. Grafas or his attorney as to why the application was pulled. Mr. Grafas has remained out of the public eye throughout the entirety of the process, and has not responded to requests for comment. Additionally, Mr. Henderson did not respond to multiple requests for comment. Those in opposition to the lot, therefore, have no way of knowing if the plans have been cancelled, or if Mr. Grafas eventually plans to reschedule the hearing for a later date. Borough planning board secretary Karen Brisben said that she believed the application would need to be rescheduled in a “timely manner,” and that if it was not, it would most likely need to be re-filed, though she could not provide a specific timeframe. Borough planning board attorney Chris Ackerman did not respond to inquires by press time. As such, the news has garnered mixed reactions from residents. While some are pleased, others say it raises more questions. Angie Carden, of Green Avenue, was “immensely” grateful to hear that the hearing was cancelled. While the application was postponed, it was not entirely withdrawn, which has led other residents, such as Lynn Schambach, of Harris Avenue, to draw separate conclusions. Ms. Schambach was optimistic, but still wary that the parking lot plans would reemerge in the future. That feeling of limbo, according to Mr. Madison — the founder of Stop the Lot — has left him displeased with the decision to postpone the hearing. “Now I have to wait another month, or another month and a half, to get things started,” he said, noting that being within 200 feet of the property, he is obligated to receive notice of plans for the property, but the hearing’s postponement has delayed any such notices. Really? The sight has held a lovely lot and a stately large home for close to 100 years. Homestead Road is filled with residential housing and with families whose children need safe residential streets to play in and parents who need less traffic congestion, not more, in order to safely access and egress their homes. Mr. Madison said he is hoping that a request for another hearing will not emerge in the winter months, when some of those in opposition may be out of town for the season. The house that stood at 623 Green Ave. was bulldozed last week, which Mr. Madison said neighbors were upset to see. For now, he said, the Stop the Lot campaign strategy is to continue spreading awareness, and he made it clear that he has no plans to stop. upport Brielle are based on property value, it would seem likely that the town would not gain, and may indeed lose, needed income. The fundament of any zoning change needs to be that it benefits the “general welfare.” This change of use from residential to commercial, would be of great detriment to the public good. BELMAR — Plans to construct a parking lot on Green Avenue, here, have been halted without explanation, and while some residents are pleased, others are cautiously wary of what’s to come next. There is only one person who benefits and profits from this requested change of zoning. There is no “consistency” in this proposal except with the river side of Green Avenue. The residential zoning, where it exists, has protected homeowners in the area from the river from further incursion by commercial interests. It is time to stand up and say “no” to the proposed violation of the intent of the residential zoning for 623 Green Ave. as well as the intent of the town plan to increase population density in that area. Please come to the meeting on Oct. 14 and let your voices be heard. The certified letters regarding a use variance to rezone the residential property at 623 Green Avenue into a commercial parking lot have been mailed. I believe that this property which is bordered by Union Lane and Homestead Road is an unsafe location for a commercial parking lot. Summer traffic in this area swells to twice the number of cars than in the off season. The most recent Coast Star article regarding the Glimmer Glass Bridge noted that according to Freeholder Curley, “on average, the bridge sees 2,000 cars daily during the winter season and up to 6,000 cars during the summer season.” It is highly conceivable that a great number of those cars approach the bridge and/or travel back into Brielle by way of Green Avenue. Over the summer months, the volume of bicycle riders and pedestrians who are out and about also multiplies. Ashley Avenue meets Union Lane just around the bend from 623 Green Avenue. Local residents are acutely aware of the confusing, congested and dangerous traffic conditions at this spot. I believe a bicycle rider even lost his life to a car collision at this junction in the recent past. Locals also know it is not unusual to witness disoriented drivers make a last ditch left hand turn from Union Lane onto Green Avenue when they realize the road they’re on dead ends at the river. Summer weekend traffic which leads to bottlenecking in the vicinity of these aforementioned streets is commonplace. This creates a hazard for many. Of equal concern is the proximity the lot is from the Jean H. Wetzel Memorial Playground, a mere 150 paces [wearing a women’s size 7 1⁄2 running shoe]. Excessive traffic in the summer, dangerous intersections, innumerably more summertime bike riders and pedestrians, the residential neighborhood and the nearby playground should be reasons enough for the Zoning Board to deny the application for a commercial parking lot. Concerned Brielle residents should make their voices heard at the Brielle Planning/ Zoning Board meeting on Tuesday, Oct. 14. Please keep safety first — please stop the lot. BRIELLE — A development application filed with the borough last week confirms that plans are in the works to level a Victorian house on 623 Green Ave. to construct a commercial parking lot. Last week, signs were erected around town promoting a campaign named Stop the Lot — an effort to prevent the plans for a parking lot from moving forward. An addendum for a zoning variance, filed on behalf of 608 Green Avenue, LLC, and Hoffman’s MarinaWest, LLC, looks to construct a 23,237-square-foot parking area and site improvements on the 23,237-square-foot lot. The application for the zoning variance is signed by Larry Grafas, the owner of Hoffman’s Marina who recently purchased Union Landing restaurant. The application is in response to a denied zoning permit application, dated June 16, that shot down the construction of commercial parking facilities in a R-4 Single Family Residential Zone, on the basis that such a project would first require a use variance. Last week, Jay Madison, a part-time Brielle resident who began the Stop the Lot initiative, said he is worried that the parking lot will detract from the character of the neighborhood. He said that he has spoken with a lawyer, and plans to garner signatures opposing the project this weekend during Brielle Day. “We didn’t want to upset Brielle Day, so we’re going to be outside trying to get signatures,” Mr. Madison said, noting that there is already an excavation crew on site at 623 Green Ave.
Mr. Madison said he has received “a lot of good reactions” from the community, and that thus far, his website has reached over 5,000 views. Mr. Grafas declined to comment. The borough’s planning board will review the application for the use variance on Tuesday, Oct. 14, at 7:30 p.m.